1. 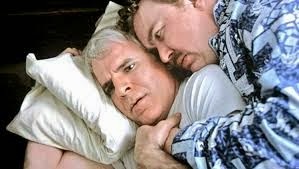 PLANES, TRAINS, AND AUTOMOBILES (1987): John Hughes took time out from directing classic teenage coming-of-age comedies like Sixteen Candles and Breakfast Club, when he put Steve Martin and John Candy together for what is possibly his very finest film. This tale of a hapless business exec just trying to make it home in time for Thanksgiving--and having to deal with an unwanted companion while a series of hilarious disasters strike around the pair--was the first film that came to mind for this article. It is a laugh-riot through much of its length that comes to an unexpectedly heartwarming conclusion, one that celebrates the spirit of the holiday with able finesse. Over a quarter-century after its release, it remains staple Thanksgiving viewing. 2. HANNAH AND HER SISTERS, 1986. Woody Allen's best-received film of the 80s is not entirely focused around Thanksgiving, although the holiday does neatly bookend the plot. The expert blend of comedy and drama is deftly handled, and the focus on a singular family--in this case, the three sisters of the film's title--tie it further to a Thanksgiving motif. The themes of adultery and betrayal are on the mature side, and yet there's nothing here that can't be viewed by the whole family (outside of perhaps young toddlers). Both Dianne Wiest and Michael Caine give memorable performances, for which both won Supporting Actor/Actress awards at that year's Oscars. 3. ADDAMS FAMILY VALUES, 1993. Critically and commercially well-received at the time but somewhat forgotten since, this delightful sequel was superior to the first Addams Family film, and a worthy successor to the original 60s series. The opening scenes--in which the Addams children concoct a riotous Thanksgiving play for their summer camp, mourning Native American genocide--are both subversive and hilarious. This film is well-worth checking out again; you'll be surprised at how well it has stood up over the decades. The cast was so good, in fact, that Anjelica Huston received a Golden Globe nomination for her role as Morticia. 4. ALICE'S RESTAURANT, 1969. This film was based around a twenty-minute Arlo Guthrie folk song from 1967, which built a story narrative around a madcap crime, arrest, and police interrogation which occurs just after Thanksgiving dinner. The film, like the song, had a strong political narrative and was seen as a counterculture indictment of the Vietnam War, the draft, and "establishment". Although that may appear to make the film dated, it is not, as the direction and acting is superb all-around. This film is another that has been forgotten over time, and yet is a recognized American classic. 5. A CHARLIE BROWN THANKSGIVING, 1973. Although eclipsed by the legendary Charlie Brown Halloween and Christmas specials, A Charlie Brown Thanksgiving is a delight, and perfect viewing for families with small children. 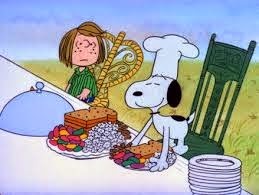 Snoopy's attempt to make Thanksgiving dinner, with toast and popcorn as the delectable entrees, will bring a silly smile to adult audiences as well. It's actually surprising that more children's animated films do not focus around this family-oriented holiday--although The Simpsons have had several memorable TV episodes which take place during this time. We here at 4seating wish everyone a very Happy Thanksgiving. Try not to pass out!